If you've ever visited a marina that felt simply enchanting – not just because of an idyllic setting, but because everything just seems to come together seamlessly – you can start to envision what it's like to tie up at Stock Island Marina Village. On my way up the coast, I stopped by to meet up with Ashley Barnes, Guest Experience Manager, for a tour of the property. Stock Island, the Key West neighborhood just north of the main island is named for, quite literally, being the home of livestock (thus the name "Cow Key Channel"); it's beginnings were as a sort of "backyard" to the main island. 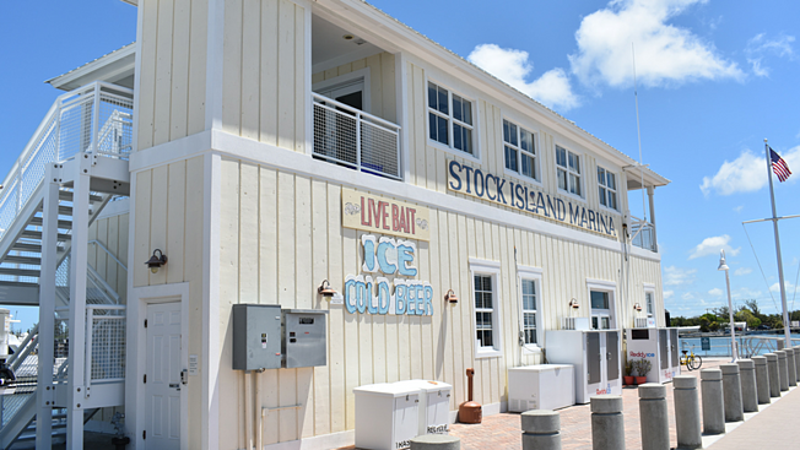 While located just north on a separate island, Stock Island has a Key West zipcode – so local businesses maintain their Key West pride as well as the independent spirit that comes with being set somewhat apart from the mainstream. 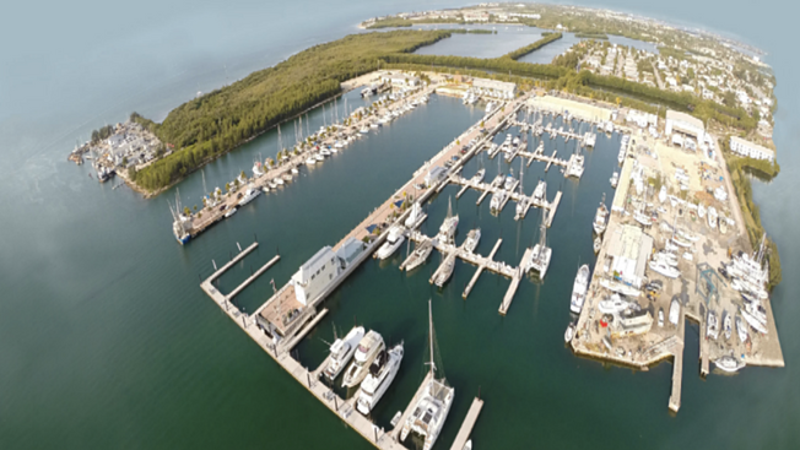 Stock Island Marina Village has set the bar high for Florida marinas. Part destination experience, part vibrant community, guests here get a 5-star facility with all the comforts of home and a staff that takes as much pride in their new on-site hotel as they do the cozy details such as the community garden. The facility and team make accommodating all boaters look easy. 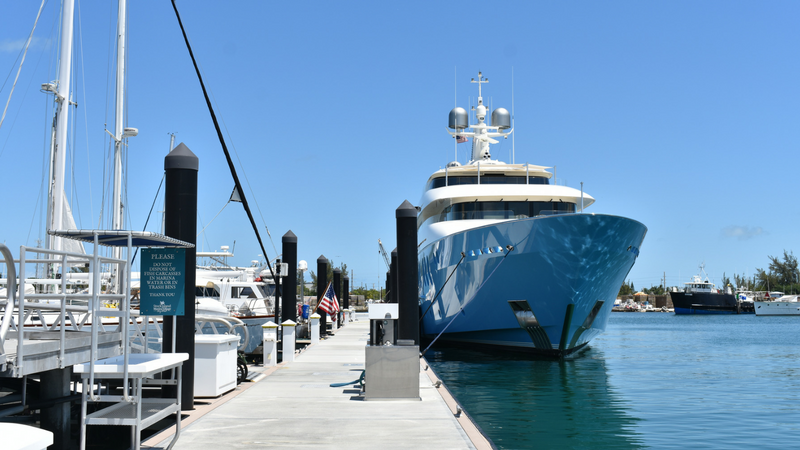 Transient boaters have access to all of their top-notch amenities, and megayachts are right at home in the deep waters throughout the marina. Stock Island Marina Village offers 220 slips on brand-new Bellingham concrete floating docks, and the team takes pride in keeping them well-kept. The average depth throughout the marina is 18'. The captains lounge overlooks the entire property, and the showers, bathrooms, and laundry facilities are close by and meticulously kept. The North Pier is comprised mostly of transient dockage, whereas Coconut Row is home to one of the last remaining liveaboard communities on Key West. The G-wall is used mostly to accommodate catamaran dockage due to the lack of restriction beam-wise. The G Wall is mostly used to accommodate Mega Yachts and catamarans.On A Dock, Charter Boat Row offers unique private experiences to marina and hotel guests alike including fishing charters, sunset cruises, snorkeling trips, scuba diving, paddle boarding, and more! Hotel guests have a front row view of all the action as Charter Boat Row is visible from the hotel pool, both restaurants, and balcony rooms. Coral Lagoon is home to some of the marina’s executive offices, but also brings in another unique part of the unique Stock Island Marina Village community: this building hosts various local on-site artists including Key West Fine Art Photography, whose work is also featured throughout the on-site Perry Hotel. The many uses for their docks reflect the diversity in boating that Stock Island can accommodate, from international megayachts to the saltiest of local fishermen. Some boats, such as the When and If pictured above (previously owned by General Patton) stay the entire winter. 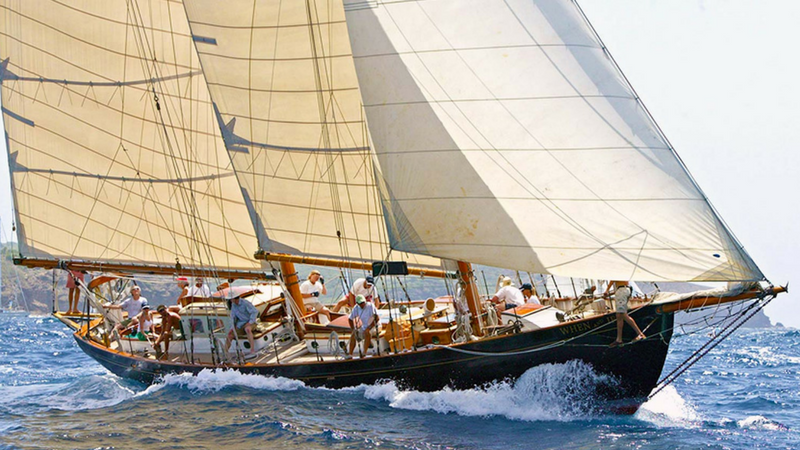 The owner of this particular vessel purchased and completely restored, and offers sunset sails of the Keys. Namaste Eco Excursions are experts in their field. They feature private day trips aboard Vessel Reef Geek where they take you snorkeling on the reef among vibrant and beautiful marine life, kayaking through peacefully secluded mangrove trails, and even teach you a thing or two about Florida Keys ecology and sustainability. The owners live on site here on Coconut Row. Along with the spotless bathrooms and showers, several wifi hotspots, 24-hour fitness center, and on-site dining, Stock Island Marina Village goes above and beyond with amenities. Dog owners will find not one but two dog parks, one for small dogs and one for large, just in case your pup prefers his alone time. 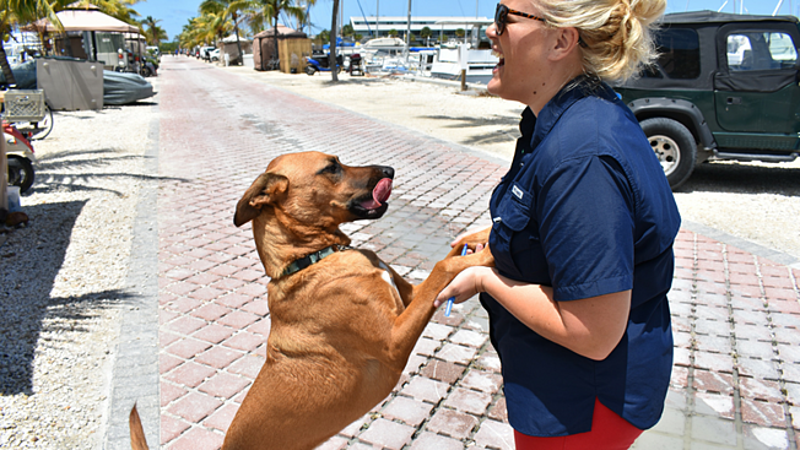 The marina is 100% pet-friendly all throughout the village, including the marina, boatels, and hotel. 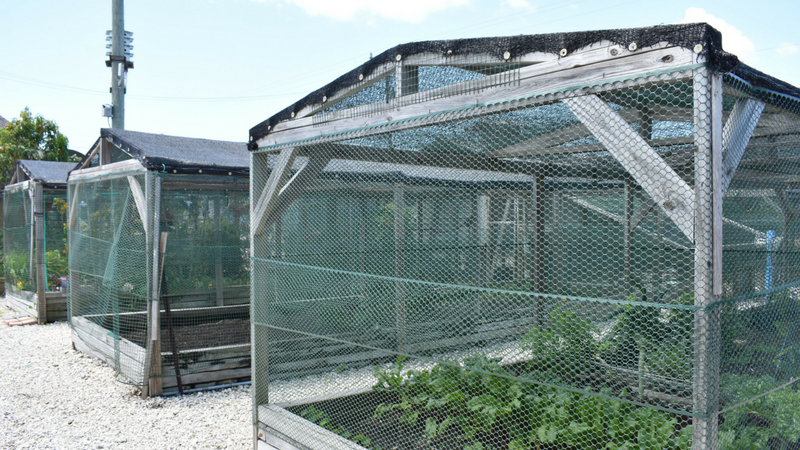 The organic community garden is available to all guests, run by a local volunteer who organizes monthly clean-ups and weeding. Fun fact: Two boaters brought their bee hives all the way from Colorado when they moved to Stock Island, and the native bees just made themselves right at home! The pollination helps everything in the garden bloom and grow. Anyone can contribute, so even when you're underway you're never far from spending a day in the garden. Nearby Boca Chica Air Station brings the occasional flyover, which has begun a new tradition: the Salty Oyster, the outdoor on-site bar, toasts each flyover, with a collection for donations to go to a local charity each time they do. De Luna's Bar & Grill, run by a local family, brings Key West residents every morning for the best breakfast in town and every Thursday for the weekly ukulele singalong. 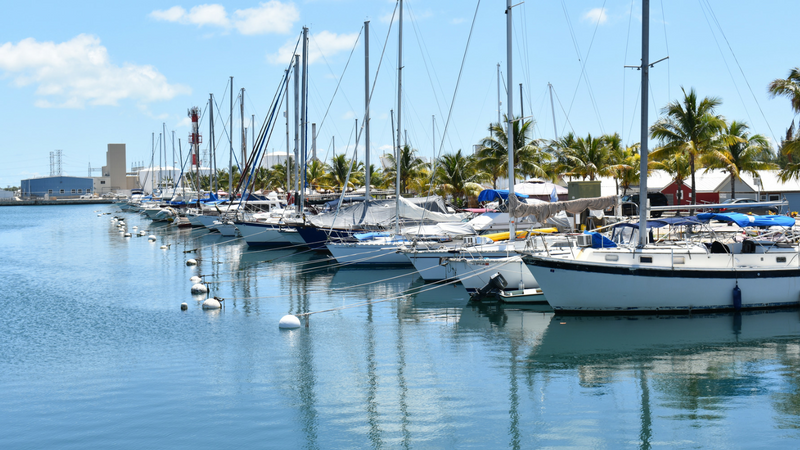 During your stay, take a stroll down Coconut Row, Stock Island Marina Village's pier of liveaboards. These slips come with an adjoining parking space just feet from the bow or stern of each slip-owners' respective boat, as well as a plot of land to host their grill, deck chairs, tiki huts, bars, and more. Do a dockwalk and see how creative these boaters get with their space! As many boaters know, staying off the beaten path has its benefits, but flexibility is always nice. 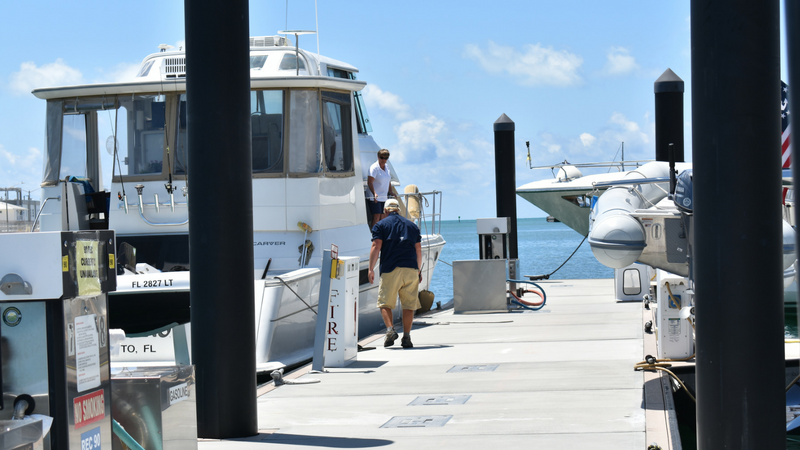 The marina’s complimentary shuttle runs continuously to and from downtown Key West from 9 AM to 9 PM, providing guests the best of both worlds. You can "Do Duval," then come back and relax. The Perry Hotel opened this week, on May 1, and with it the new pool and dining options! 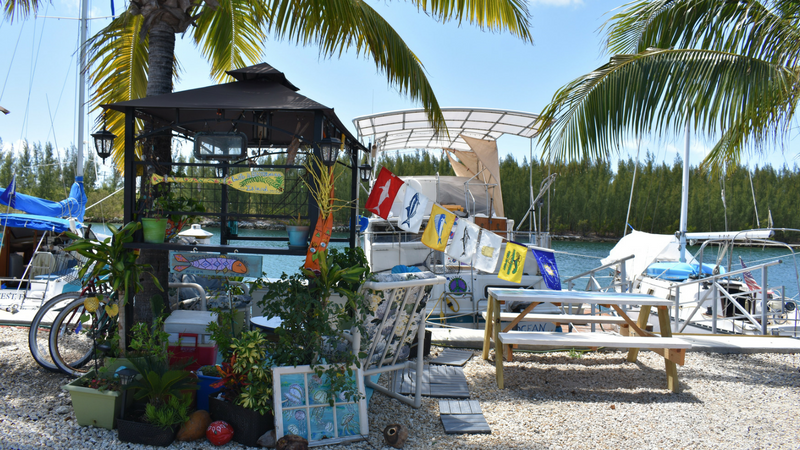 The aforementioned Salty Oyster is the outdoor open-air pool bar and grill with outdoor seating and firepits, while inside boaters will find Matt's Stock Island Kitchen an excellent fine dining option and event space. 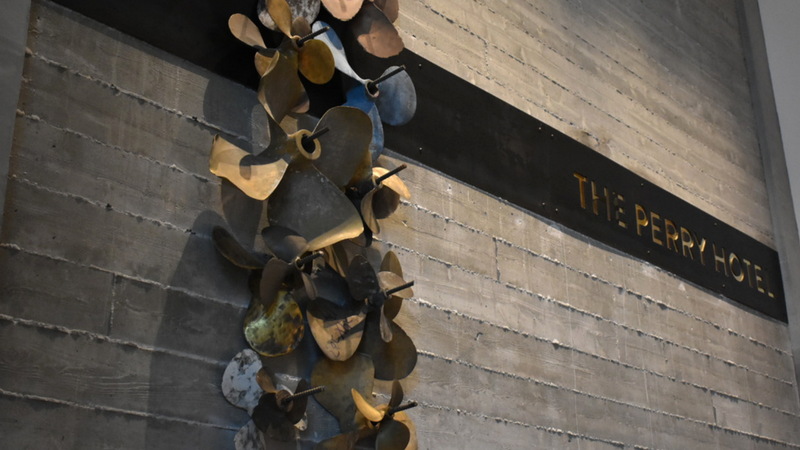 The hotel continues their theme of honoring the local history and culture; the wood in the lobby is recycled teak, and nods to Hemingway and local maritime industry are found throughout the property. 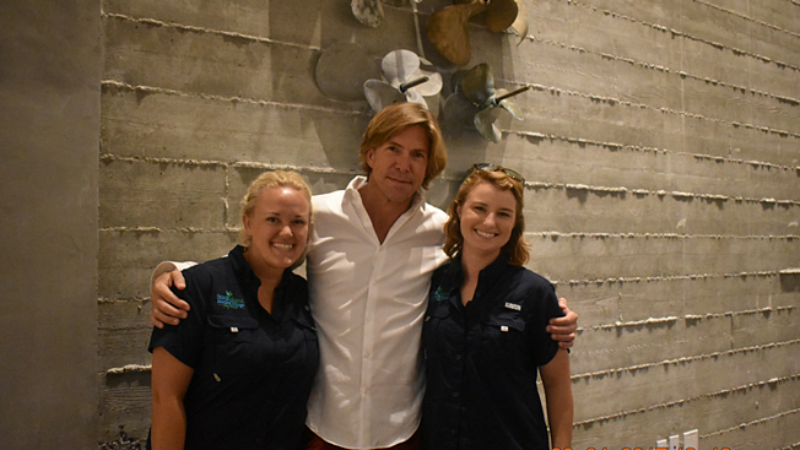 "We're trying to hang on to the fact that we're right smack-dab in the middle of what is very much a working waterfront," adds Mike, the General Manager. The concrete, teak and iron aesthetic honors the working waterfront. As Key West's tourism industry evolved and grew, the fishing industry moved to Safe Harbor. At 25' deep, Safe Harbor and Stock Island were a perfectly accessible new home for the fishing boats – but the channel and harbor depth aren't due to dredging. The reason it's so deep is because in the 1940s and 50s, they took the soil from Stock Island and moved it to New Town on Key West, which was formerly estuaries and mangrove swamps. This location is also ideal for larger cruising clubs; during my visit the Ocean Reef Yacht Club happened to be staying at the marina for a rendezvous en route to Cuba. Entering the marina, Hawk Channel is a deep water channel that leads into Safe Harbor Channel, which has a continuous 18' depth as it leads into the marina itself. As you approach the marina from Hawk Channel, the first pier you see to port is Coconut Row. 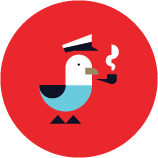 To reach the transient slips, you'll proceed past the 400'+ fuel dock, turn to port, and find a dockhand awaiting your arrival. Thanks so much to Ashley, Mike, Laura and the team for the hospitality!